Kendra James lives in London, Ontario with one cat and a mischievous puppy named Shayla. Her three children have flown the coup. She enjoys spending time with her granddaughter, Jasmine, writing, reading, or time in her garden to being in the kitchen. She writes romance under the pen name of Kendra James. Her mystery, YA, children's novels, and poetry are written as Bev Irwin. 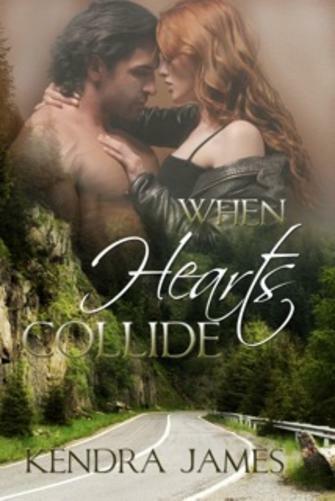 WHEN HEARTS COLLIDE, her first published romance, came second in the Heart of the Rockies contest in the contemporary category. FAMILY SECRETS, a novel in progress, came second in the romantic suspense category. If you witnessed an accident on a lonely stretch of highway, would you stop or continue on your way? For nurse Molly Tanner the choice is clear. Risking her own life, she pulls the seriously injured driver and his young daughter from the car. When Pearce begs her to pose as his wife to keep Gracie from foster care, memories of her unhappy childhood rush back. But can Molly keep up the charade without her own secrets being discovered and her heart from being shattered? “No one ever said life was fair.” Molly clutched the leather-wrapped steering wheel of her Cavalier, her grandmother’s favorite saying echoing in her head. Well, wasn’t that the truth. Fight or flight. Those were her two options. But was fleeing the right decision? The sun had set an hour before, and the cloudy sky overhead hung like a mantle of coal. Molly tried to banish the fatigue descending on her. She should have stopped at that last motel, even if it did look like it would qualify for a five-star roach award. She could add that to her list of regrettable decisions. The highway, arrow-straight when it left Hillsborough, now twisted and turned like a corkscrew. Pine trees bordered the roadway, encroaching like shadowy ghosts. Scenes from horror movies with lonely highways sent a shiver down her spine. Why hadn’t she left while it was still light? Molly tried to suppress a yawn. Wake up girl, you need to stay alert. She flipped the air flow to maximum. Maybe the cool air would keep her going for a few more miles. She glanced in the rear-view mirror—no one else on the road, nothing to distract her, nothing but blacktop and an inky saw-toothed line of trees. She turned the radio up and listened to the lonesome country tunes. It wasn’t working. She switched to a rock station. “I’m not ready to make nice, I’m not ready to back down.” That was better. Just the way she felt. Molly sang along. Opening the window, she let the pine-scented breeze slap her awake. A car approached, its bright headlights flickering like fireflies between the thick trunks of the evergreens. At last, a sign of life, the first she’d seen in the past half hour. The lights came closer, causing the pavement to take on the appearance of a striped swamp snake. The roar of a high-powered engine amplified as the distance between them shrank. Thankfully, the high beams switched to low. Molly jerked herself alert. What’s wrong with you? He’s on his side of the road, and he isn’t speeding. Why did she have a sudden sense of apprehension? Calm down. The road’s wide enough to share. There was a flash of movement. A white-tailed deer darted across the highway fifty feet in front of her. Instinctively, she white-knuckled the steering wheel. Her foot eased off the gas, and the car slowed. At least something was going right. Her hands loosened their grip, and she settled back into the seat. A screech of tires broke into her thoughts. Her back stiffened and her heart rate spiked. She clutched the steering wheel again, but her palms were sweating and she had trouble maintaining her grip. The oncoming car veered towards her, its headlights hitting her full in the face, momentarily blinding her. Molly froze. Oh God,no. Her breath wedged in her throat. There was nothing she could do. Her heart skipped several beats as she battered the brakes. Too late. She was heading straight for the car. She hunched forward, bracing for the inevitable crash. Unable to breathe, Molly watched as the sports car lurched to the left and hurtled away from her. Hands trembling, Molly relaxed her foot and eased the car to the side of the road. One car out of control was enough. She watched in horror as the Jaguar’s wheels caught the ridge where pavement met gravel. It freewheeled sideways.There was a thunderous crash. A mushroom cloud of sand and gravel littered the darkness, obliterating the car. Where was her cell phone? She fumbled through her purse.When would she learn to keep it on? The phone had migrated to the bottom corner of her canvas bag. Her fingers grasped the oblong object, and she flipped it open. Molly pressed the ‘on’ button. Only three numbers, why was she having trouble finding them? Seconds crawled as she waited for the screen to illuminate. She twisted in the seat. Like a theatre curtain drawn in reverse mode, gravel and dust sifted back to the ground. In horizontal slices, the car inched into view. The hood and driver’s side were crunched into the base of a large pine tree. Her thumbs finally managed the number.